Aerial Houston Over Buffalo Bayou - This is a Houston Skyline aerial of the cities view from a birds eye view during the daytime. 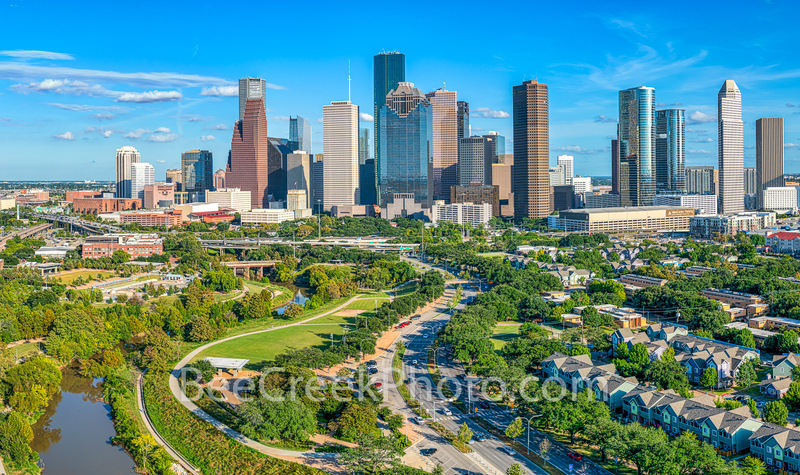 This image of the city includes the Buffalo Bayou along with the Jamail Skate Park and the Eleanor Tinsley Park with all the high rise skyscrapers in downtown in view. In this skyline image you can see many of the green areas in downtown with the parks along the Buffalo Bayou. Photo © copyright by Bee Creek Photography - Tod Grubbs / Cynthia Hestand.